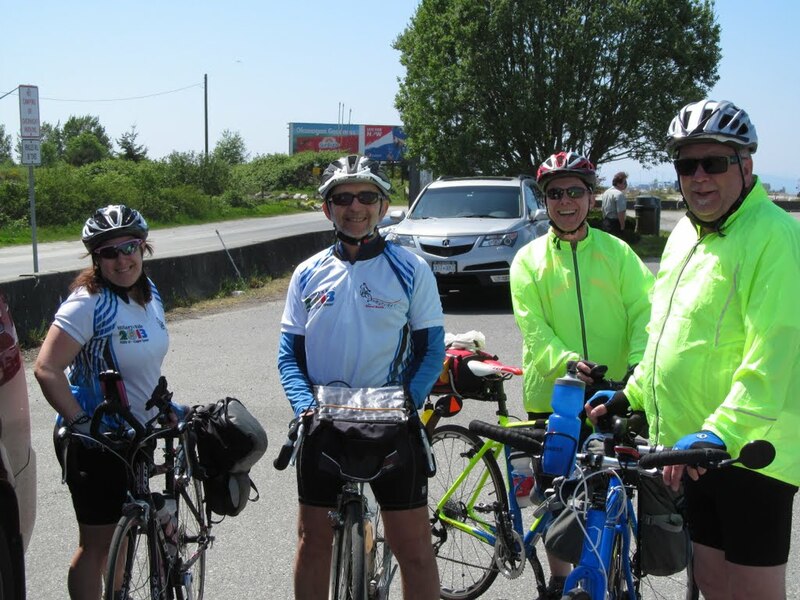 The team reach the ferry terminal at Swartz Bay to cross to the mainland on day 1. We had a terrific sendoff in Victoria. The concert was fantastic, the breakfast with alll the family and friends was great and the weather was perfect. And we made the early ferry! The Hope to Princeton leg had 2 big climbs, and then a windy road (no opportunity for pictures). The next day was a rush to get to Osoyoos, then up to Oliver to stay, and on to Kelowna. The event was great and perfect for the theme of the ride. Too bad there was no TV crew to reach a wider audience. A big climb out of Osoyoos, way to go Bill. Spot directed new friends Neil and Cathy to our campground in Midway, with an invitation to dinner the next evening in Castlegar. We heeded warnings about the Salmo Creston (Kootenay) Skyway, and opted for an extra 20km through Nelson. It was not an easy day, what with rushing to the catch the only one ferry running, and all those darn hills. But extremely beautiful. First order of the day was to ride the 22 km back into Creston. I knew it was beautiful, and Patrick got some great shots so that I could enjoy it too. While driving the RV I only got glimpses of the sights. Day 9 was a well deserved rest day in Cranbrook. The day was cloudy so I missed some great shots I should have taken when we arrived. We are in the beautiful mountains here. Fernie is nestled in with snow capped mountains on all sides. I have dreams of creating a few summary posts to pick various highlights from our 67 day adventure, so stay tuned.